The MBTA provided the Fiscal and Management Control Board (FMCB) with an update on major short-term improvements with Green Line track areas along with a long-term strategic plan for continued track maintenance, which will improve service for customers and increase the reliability of the fleet. 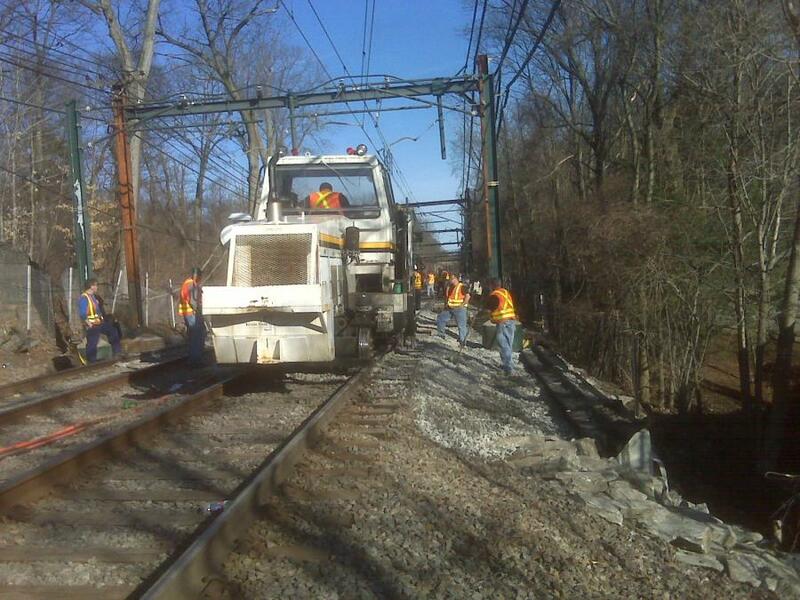 Using accelerated rail replacement techniques, the MBTA's Track Department has accomplished the installation of five hundred or more feet of new track in three-hour segments during overnight hours, work that previously took entire weekends to complete. These methods include pre-welding rail to the desired length, pre-staging materials, pre-installation of tie and plate work, and post-installation material removal. To date, work has consisted of the replacement of nearly 25,000 ft. of track, and approximately 1,000 ties and tie plates, leading to a reduction in track defects by 50 percent. The corresponding upgrades have led to the lifting of speed restrictions in place at certain locations where work was performed; the MBTA estimates that lifting those speed restrictions resulted in improved travel times of seven minutes. These and other short-term improvements set the foundation for core infrastructure work, which will be done in the months and years ahead as part of a comprehensive Green Line Track Renewal Plan. Green Line track replacement and maintenance work in the last two years has included: rail gauge face angle upgrades on over 90,000 ft. of rail; upgraded crossings at Packards Corner, St. Paul Street, Summit Avenue and Lake Street; the ongoing development of new training methods and track renewal plan; optimization of the Track Geometry Collection; upgrades to Type 8 Trucks Yaw Device and Primary Suspension; the execution of track work contracts; flange lubricators deployed on all Type 8 Green Line cars; LIDAR data collected on the entire Green Line; and improvements to work methods that have led to the dramatic increase in lengths of continuously welded rail during night shifts. These completed improvements have resulted in the major reduction of wheel wear, which has directly contributed to an increase in Green Line fleet availability and reduced demand on the Riverside truck shop. Derailment risks are also significantly reduced with 100 percent of all Type 8 Center Truck Flange Lubricators installed. While these major short-term improvements have had significantly positive results for MBTA customers, a long-term plan is necessary to continue to upgrade the Green Line's track. Last replaced in the 1970s and 1980s, the Green Line's rail, ties and other track components will eventually not be able to be maintained to standard and will require full replacement. The total duration and cost of Green Line track renewal is dependent upon the access the MBTA is allowed to have to do the work, which could include full week, weekend, or evening shutdowns with Green Line service replaced with dedicated shuttle buses. Next steps for updating the Green Line include finalizing the Green Line Track Renewal Plan, approval from the Fiscal and Management Control Board regarding accessing the track area for replacement, developing contingency plans, and integrating MBTA and other stakeholder activity to maximize work efficiency and minimize disruptions. Construction costs of the Green Line track replacement project are estimated at $120 million with an estimated duration of approximately 36 months.